My cousin plays American Football at one of the local clubs around here, called Enschede Broncos. Today they are having a home game against another local team. 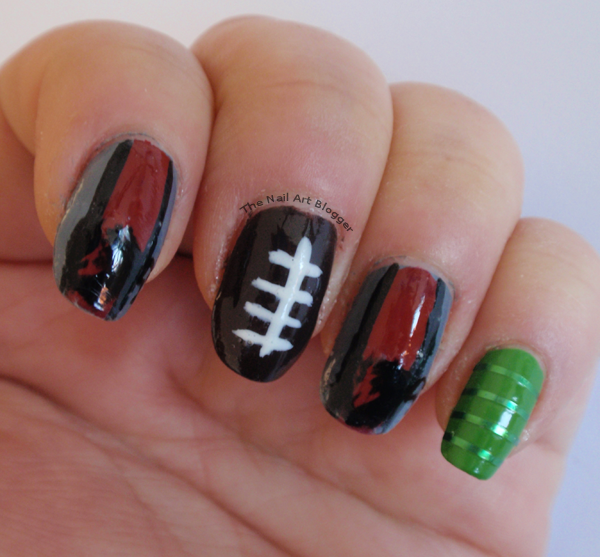 In a way to show my support, I decided to make football themed nail art, using something from the team logo. In this case, it was the horse. I started off with a base coat, using the XXL nail protector from Essence. Then I painted my thumb and pinky green, index and ring finger gray, and the middle finger a dark brown. Then I added the stitches using a white color. 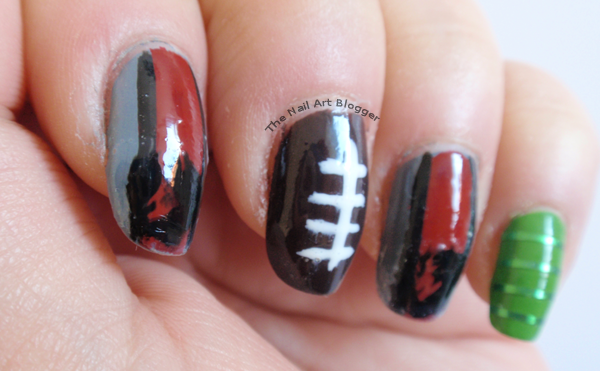 After letting the polishes dry, I added a red stripe down the gray color, and two thin black lines on each side of the red. I tried to emulate the logo of Enschede Broncos (you can see the logo on their homepage), and so I wanted to use the horse from the logo. So I also made decals because it makes life easier when you don't have a horse in a stamping plate, and you're not very good at drawing tiny designs on both of your hands. After placing the decals on my nails, I realized I shouldn't have made the black lines because you barely see the horse there unless I tell you there's a horse, and even then I'd be skeptical about it. But it was too late to go back, so I just went ahead with it. It's the thought that counts, right? 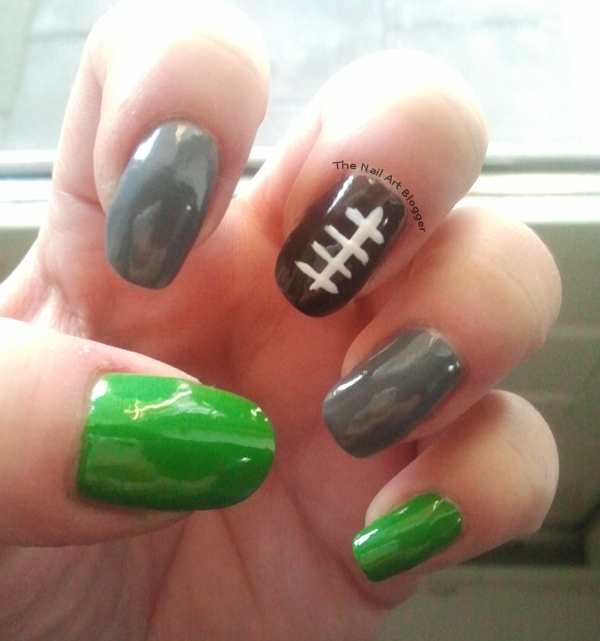 I also added green striping tapes on my thumb and pinky. 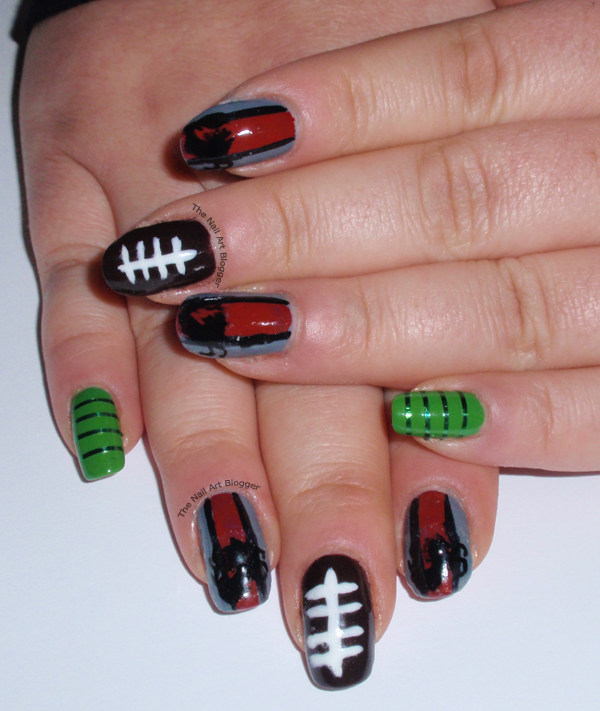 From looking around the web for football inspired nails, I saw a lot of people using the field as a design. 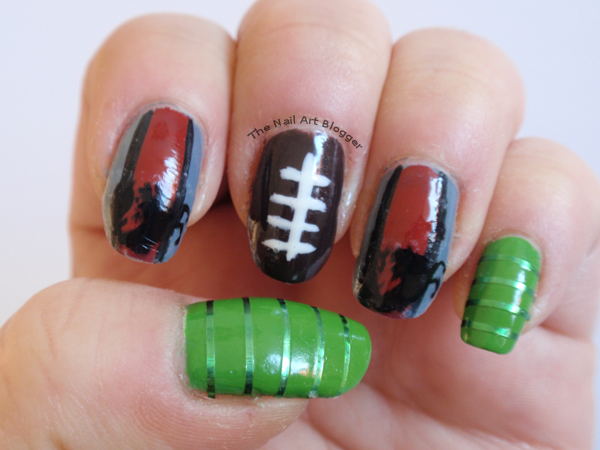 And so this was my take on it, using striping tape instead of painting light green stripes. It's a bit of a work, but I like the end result. And here's a shot of both of my hands. As you can clearly see, the stitches on the right hand looks horribly different. Still working on getting better at using my non-dominant hand when doing my nails. One of these days I'll master the art of using my left hand for doing stuff! I hope that you liked my design for today. And I'm wishing my cousin's team lots of success in today's match. Do you like American Football? Or are you a Rugby person?